Wow! So many changes since the last report. 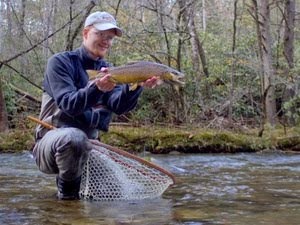 First, the streams in the Smokies are mostly in good shape except after rain events. Water has been a bit on the high side in some drainages but overall conditions are very good. Our early hatches are giving way to lighter colored bugs now. Light Cahills, Pale Evening Duns, Blue-winged Olives, March Browns, and Hendricksons have all been on the water at times. The huge Black Stoneflies are around now as well and providing some big bites for hungry trout. Sulfurs should be starting fairly soon, especially with all of the nice weather we are having. Little Yellow Stoneflies are just starting to show up now as well and will get much stronger as May approaches. 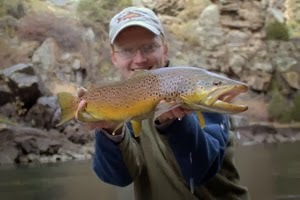 The yearly pinnacle of spring dry fly fishing is quickly approaching! Tailwaters are starting to fish well. The Caney Fork is still blowing a LOT of water. That should change fairly soon if we don't get too much rain. I'm thinking we might start seeing some opportunities in early May if things hold steady, maybe sooner. The Clinch has been fishing extremely well. Big hard fighting rainbow and brown trout are the target here on light tippets and tiny flies. Bring your A game or go home disappointed. Sulfurs should start to really take off shortly along with more caddis than we have already been seeing. Fishing is all about having fun which should mean just getting out and enjoying the time on the water. Sometimes I just want to catch some big fish though. This summer I've been hoping to find a good brown out feeding. So far it hasn't happened but the fish I'm catching keep getting larger, slowly but surely. 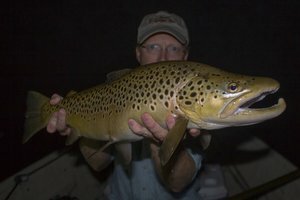 I've been consistently catching rainbows up to around 10 inches with some slightly larger, and last night I caught a better than average brown. It was around sunset and I was on the last pool of the day. I leisurely fished my way up through the pool, catching a couple smaller rainbows before getting up to the head of the pool. An overhanging tree limb was in my way but I decided to force the issue. There was a rock with a deep slot up against the far bank which just looked fishy. Carefully I checked behind me for trees before picking up my line. The forward cast was perfect as I punched it far up under the branches to the upper end of the good lie. Suddenly there was a swirl as something took the dry and it was game on. The brown gave my 3 weight rod a good workout running up and down the pool but in the end I prevailed. Carefully I snapped a quick picture as the 11 inch brown came to hand, then I gently picked him up and held him facing the soft current. Apparently the fish still had some energy and after a couple seconds, he bolted back to the shadowy depths of the pool called home. Nice! 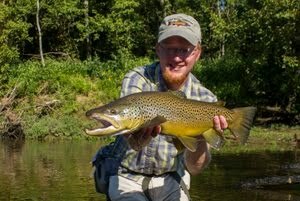 We've got some pretty amazing brown trout water close by. 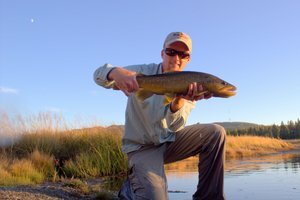 My brother fishes is quite a bit - 20+ inchers are pretty common...it can really be a lot of fun and a great way to spend an evening after work!